SNES Mega Man X2 (USA) in 34:16.97 by Blechy. 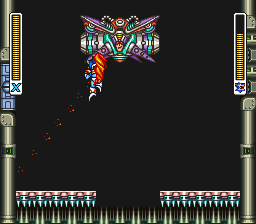 Mega Man X2 makes a particularly interesting run as many of the weapons can actually be used in mobility, such as a grappling hook or even a weapon which can make enemies into platforms. The author takes special care to ensure that when there is a situation in which a weapon would help him progress quicker, he uses it. In order to get the Shouryuken (flame uppercut) seen used towards the end of the movie, the author must first collect 100% of items, such as Heart Tanks, Sub Tanks, and Item Capsules. However, because these powerups are not far out of the way, and because the Shouryuken saves so much time later on, it turns out that this movie may also prove to be as fast as possible. Many thanks to Boco for early route planning and glitch information! The page Mega Man X Tricks explains some of the tricks that are and/or can be used in the X series games.